In my examination of fancy colored diamonds thus far, I have talked about the value of rarity. Fancy color diamonds acquire their value because they are a curious occurrence in nature that cannot be predicted. They occur in tiny quantities, and these quantities are ever decreasing, as producing mines slow down or close indefinitely. Nowhere is this rarity more obvious than in red and purple diamonds. In a good year, we might only unearth one or two of these diamonds. It is often difficult to talk about them because so little is known about their causes and origins. Scientists believe that red coloration is caused by a deformation of the diamond’s crystal lattice structure, known as ‘plastic deformation.’ When light passes through this unusual crystal structure, it bends in a way that reflects a ruby-like color, which varies in intensity. The same process gives pink diamonds their color. However, science has not yet been able to definitively identify why this crystal deformation can lead some stones to show pink coloration and others red, or the causes of the deformation in the first place. Current thinking is that the more deformation displayed, the more tendency towards red coloration. They are so rare, in fact, that only 20 to 30 true red diamonds are believe to exist in the world, and most of them are below half a carat. Because of their rarity, red and purple diamonds are not often used in jewelry, and are more likely to be stored in the safety deposit boxes of investors fortunate enough to acquire one. Because these diamonds are seen and sold so infrequently, it is impossible to track prices, except to say that they command large valuations whenever they are made available to the world. To illustrate: in 1987, the heirs to the estate of American rancher Warren Hancock put up for auction a high quality red diamond of 0.95 carats. The stone was sold for $880,000 after reportedly being purchased for $13,500 in 1956 – a 6,500% return on his investment. In May 2013, Rio Tinto announced a statistical anomaly. A total of three red diamonds were included in the company’s annual pink diamond tender. To put this in perspective, in the nearly 30 years of mining at Argyle prior to this date, the company had only ever recovered three other red diamonds from the mine. 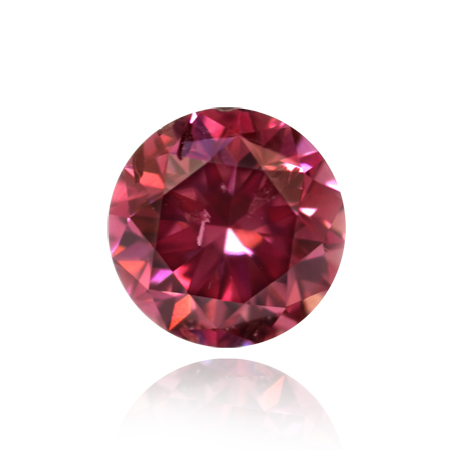 Like reds, purple diamonds are caused by some measure of crystal deformation. A purple diamond also requires the presence of hydrogen in large quantities within the diamond during its growth phase. These two features together make pure purple diamonds virtually non-existent. As a result, purple is more often found as a secondary shade, rather than as a pure primary color. Depending on the various hues of purple coloration, these diamonds typically are given unique marketing terminology like ‘Lilac’, ‘Plum’, ‘Orchid’, or ‘Grape’. Pure purple color is so unique that an additional color classification was needed to distinguish purple diamonds from diamonds that contain Boron, which have become known as violets. Violet is mostly a secondary color that often accompanies blue or grey primary colors. 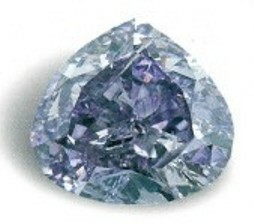 A unique diamond is currently part of the 2016 Argyle Pink Diamond tender, which has been given the color classification of fancy deep grayish bluish violet, and has been named the Argyle Violet. In a different kind of scientific anomaly, there is a diamond that might be considered both red and purple at the same time. The ‘Supreme Purple Star’ apparently appears as a deep purple when viewed from the top of the table, but becomes a crimson cranberry purplish-red when tilted on its axis. This diamond surfaced in London sometime in 2002, but its origins and current location are a mystery. Even the weight of the diamond is known only anecdotally: observers have put the weight at somewhere between 2 and 5 carats. The diamond was graded by the British Gemological Institute, but details of their grading report are not publically available, and the stone has not been seen since. The most famous red diamond in the world is probably the ‘Mossaieff Red’, since it is also the world’s largest. The stone was cut by the William Goldberg Diamond Corporation from a rough stone weighing 13.90 carats. It was transformed into a 5.11 carat internally flawless trilliant cut fancy red (ruby red). The rough stone was found by a farmer in the Abaetezinho River in the Alto Paranaiba region of Brazil sometime in the 1990s. The diamond was acquired by Moussaieff Jewellers in 2001 for an estimate $8 million and promptly given its present name. 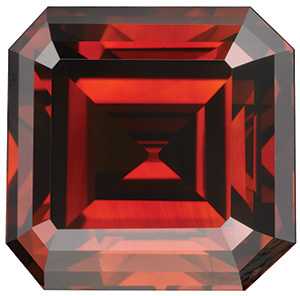 In 2003, the ‘Moussaieff Red’ was displayed at the ‘Splendor of Diamonds’ exhibit at the Smithsonian Institute. The story of the ‘Kazanjian Red’ diamond might be described as the greatest diamond investment of all time. The Kazanjian Red is one of only three polished diamonds in existence that are larger than 5 carats. The stone was first discovered in 1926 and was originally a 35-carat rough stone. The rough diamond was believed to be black bort, a term used to describe industrial diamond that is only useful for cutting and manufacturing equipment. 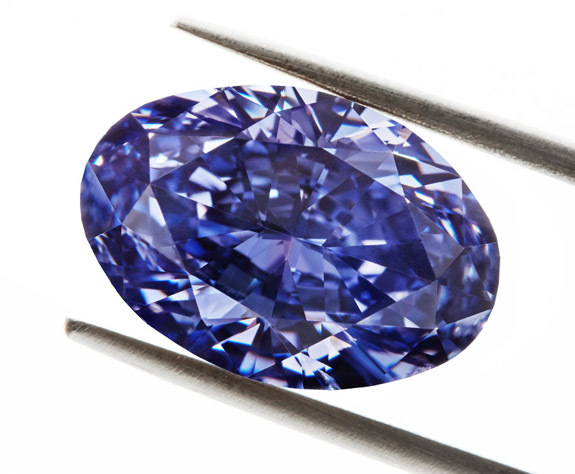 The stone was sold for just £8 per carat and was sent to Amsterdam to be cut by the Goudvis Brothers. After initially cleaving the stone, the brothers noticed an unusual brown color hiding within. The stone was eventually cut down into a 5.05 carat deep ruby red square emerald cut. The Kazanjian red was confiscated by the Nazis during World War II. Miraculously, the stone was returned to its rightful owners after the war but was later sold repeatedly until disappearing from public view in 1970 for 37 years. When the stone resurfaced, it was bought by the California based Kazanjian Bros. gem and jewelry firm. 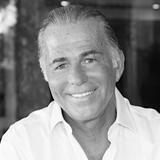 The stone is now part of the Kazanjian foundation, which displays the stone and uses proceeds to finance humanitarian efforts for disadvantaged children and youth. The ‘Royal Purple Heart’ is the largest fancy vivid purple diamond in the world, at 7.34 carats. Little is known about this diamond, but it is believed to have been cut in partnership with the Julius Klein Corporation. It is an I1 clarity diamond that British Gemologist Michael Hing describes as having "diagonal surface graining that is clearly visible to the naked eye on the table facet if you look at it under a glancing light.” The diamond is believed to have been mined in Russia, buts its exact date and location are unknown. The ‘Royal Purple Heart’ is not actually a pure heart shape, as it lacks the ‘cleavage’ at the top of the stone that forms the traditional heart shape. It is believed that the unusual modified shape was chosen to maximize the finished size of the stone. Although red diamonds are often credited as being the most rare shade of fancy color diamond, some prominent diamond dealers would likely object since they are more likely to have seen a red diamond pass through the their shops than a purple one. Regardless, both are an extraordinary gift of nature, which even those active in the diamond industry may never see in their lifetimes.